The Financial Supervision Commission has approved a minimum yield of 2.45 % on an annual basis, resulting from the management of the Universal Pension Funds /UPF/’ assets for the preceding 24-month period, considered from 28 December 2012 till 30 December 2014, while for the same period of time the minimum yield for the Professional Pension Funds /PPF/ has been determined at 2.62 % on an annual basis. The weighted average yield (modified weighted yield ) of UPF for the same period, calculated on an annual basis, is 5.45 % and for PPF 5.62 % respectively. The International Federation of Pension Fund Administrators (FIAP) wishes to publicly express its concern regarding the Bulgarian Government’s decision to modify the pension system, undermining the functioning of the mandatory individually-funded program (2nd Pillar). The Financial Supervision Commission has approved a minimum yield of 2.96 % on an annual basis, resulting from the management of the Universal Pension Funds /UPF/’ assets for the preceding 24-month period, considered from 29 September 2012 till 30 September 2014, while for the same period of time the minimum yield for the Professional Pension Funds /PPF/ has been determined at 3.25 % on an annual basis. The weighted average yield (modified weighted yield ) of UPF for the same period, calculated on an annual basis, is 5.96 % and for PPF 6.25 % respectively. The Financial Supervision Commission has approved a minimum yield of 3.99 % on an annual basis, resulting from the management of the Universal Pension Funds /UPF/’ assets for the preceding 24-month period, considered from 29 June 2012 till 30 June 2014, while for the same period of time the minimum yield for the Professional Pension Funds /PPF/ has been determined at 4.24 % on an annual basis. The weighted average yield (modified weighted yield ) of UPF for the same period, calculated on an annual basis, is 6.99 % and for PPF 7.24 % respectively. The Financial Supervision Commission has approved a minimum yield of 3.29 % on an annual basis, resulting from the management of the Universal Pension Funds /UPF/’ assets for the preceding 24-month period, considered from 30 March 2012 till 31 March 2014, while for the same period of time the minimum yield for the Professional Pension Funds /PPF/ has been determined at 3.82 % on an annual basis. The weighted average yield (modified weighted yield ) of UPF for the same period, calculated on an annual basis, is 6.29 % and for PPF 6.82 % respectively. The conference brought together EU and national decision-makers, renowned academic experts and senior stakeholder representatives to review the progress achieved and to discuss what still needs to be done in the key areas covered by the White Paper and within the rapidly evolving context of the EU economic governance. The conference was structured in three thematic panels, each chaired by the responsible member of the Commission. · László Andor opened the conference and introduced the panel discussion on balancing time spent in work and in retirement. · Michel Barnier focused on the contribution of supplementary savings to safe and adequate retirement incomes. · Olli Rehn looked at the link between pension reforms and sustainable public finances. In addition, a fourth panel discussed the longer-term future for pensions in the EU and how pension systems could best serve future generations of Europeans. The Financial Supervision Commission has approved a minimum yield of 3.22 % on an annual basis, resulting from the management of the Universal Pension Funds /UPF/’ assets for the preceding 24-month period, considered from 30 December 2011 till 30 December 2013, while for the same period of time the minimum yield for the Professional Pension Funds /PPF/ has been determined at 3.27 % on an annual basis. The weighted average yield (modified weighted yield ) of UPF for the same period, calculated on an annual basis, is 6.22 % and for PPF 6.27 % respectively. The Financial Supervision Commission has approved a minimum yield of 2.75 % on an annual basis, resulting from the management of the Universal Pension Funds /UPF/’ assets for the preceding 24-month period, considered from 30 September 2011 till 30 September 2013, while for the same period of time the minimum yield for the Professional Pension Funds /PPF/ has been determined at 2.93 % on an annual basis. The weighted average yield (modified weighted yield ) of UPF for the same period, calculated on an annual basis, is 5.75 % and for PPF 5.93 % respectively. 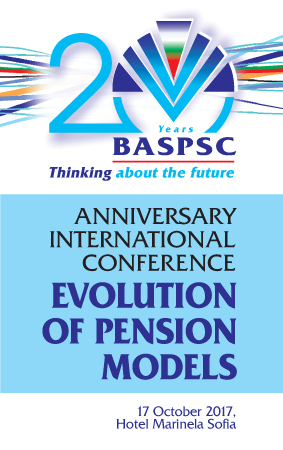 BASPSC has sent its answers to the questions, included in the EIOPA’s Discussion paper on a possible EU-single market for personal pension products. The Financial Supervision Commission has approved a minimum yield of 0.47 % on an annual basis, resulting from the management of the Universal Pension Funds /UPF/’ assets for the preceding 24-month period, considered from 30 June 2011 till 28 June 2013, while for the same period of time the minimum yield for the Professional Pension Funds /PPF/ has been determined at 0.68 % on an annual basis. The weighted average yield (modified weighted yield ) of UPF for the same period, calculated on an annual basis, is 3.47 % and for PPF 3.68 % respectively.